With This gorgeous Concha Azul Esquina Mexican Talavera tile you can create colorful and vibrant scenes in your kitchen, backsplash, countertop, giving that special touch that only Mexican traditional tiles can give. 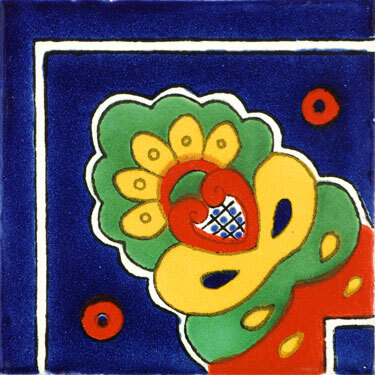 Select different designs of our Mexican Talavera Tiles collection to suit your personal style. The limitation is your imagination. Mexican tiles can also be used in wall bathrooms, floor inserts, tabletops, you can created an atmosphere of rustic style using our Mexican traditional handmade tiles. We offer a great variety of patterned Mexican ceramic tiles, when you acquire these Mexican ceramic tiles you are not only buying the tiles itself but culture and folklore.